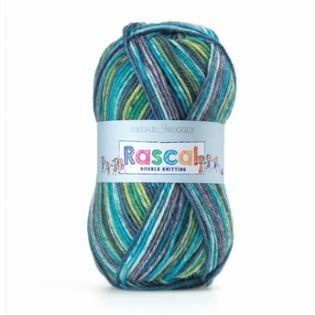 Home > Baby Double Knit Yarns with Knitting Patterns to Inspire..
Sirdar baby yarns are beautiful quality and come in a wide range of yarn weights, fashion and classic baby colours and even some wonderfully tiny textures and tweeds. Snuggly has been adored by generations and is the UK's leading brand of baby yarn. 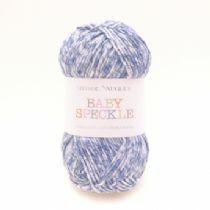 It is the most gorgeous range of yarns for baby knitting. 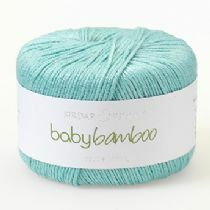 Sirdar baby yarns are soft to wear and easy care - prefect for all those gorgeous baby garments and blankets. Sirdar and Hayfield produce beautiful baby books with an array of pretty, yet practical patterns. Stunning modern garments for a smooth and gentle wonderfully soft yarn. King Cole Patterns and design leaflets represent wonderful value...always incorporating many garments making them a very popular choice. Cake yarns have been the biggest trend this year, so this season we have launched our gorgeous Snuggly Pattercake DK, a cake yarn especially for babies! Pattercake DK comes in a 150g cake and in 7 beautiful shades. There are the jolly brights of Flossie, Candy Cane and Seaside Surprise, and the more traditional shades of Sweet Dreams and Chocco Love. The Sirdar design team have created 6 wonderfully cute leaflets with designs for baby girls and boys from birth to 2 years. Each ball band also has the pattern for a gorgeous little blanket on so you can get knitting straight away! Snuggly Doodle DK comes in a range of vintage inspired shades, each one with a colourful nep running through it that creates a tweedy effect. Snuggly Doodle DK is an acrylic and polyester blend and is machine washable. Hayfield Baby Blossom DK is an incredibly pretty yarn, each of the gorgeous shades has a dainty flower print effect that appears as you knit! Hayfield Baby Bonus DK is a great value yarn in a range of shades perfect for babies, produced by Sirdar. Its reliable quality is popular with all our customers. Baby Changes DK is a new baby yarn with a subtle colour phased effect on pure white – a beautiful way to create a fresh and pretty baby yarn. There are two blues for boys, a gorgeous green and yellow mix for girls or boys. And there’s a bubblegum pink, a pale pink and a peach, pink and lilac for the girls. 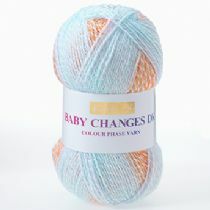 Baby Changes DK comes in a 100g ball and is made from easy care 100% Acrylic. Hayfield Baby Double Knitting is a great value, great quality Hayfield yarn. It has a fantastic 70% acrylic, 30% nylon blend in a 100g format. Baby DK is enjoyable to knit with and comes with a wide range of designs and colours, including pretty pastels and fun brights. Hayfield Baby Double Knitting is easy to knit and easy care, making it the perfect all round baby yarn. Hayfield Baby Bonus Lustre Dk is a soft baby yarn made with a wonderfully lustrous twist that adds a pretty glisten to your knits. 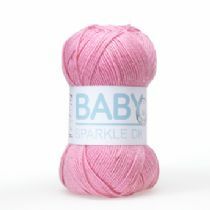 It comes in very pretty baby pastel shades in a good value 100g ball. As it is a true double knitting yarn, it will knit to all Sirdar Dk leaflets. Sirdar Snuggly Baby Bamboo DK Specially developed to be incredibly soft, gentle and smooth for Baby, this yarn is a new blend with natural bamboo and wool fibres. It will keep its quality through gentle machine washing. 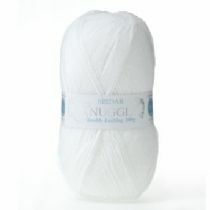 Sirdar Snuggly Baby Cotton DK is made from the softest Egyptian cotton and is 100% natural fibre. This beautifully soft yarn has all of the qualities of a perfect baby yarn- incredible softness, gentle on the baby's skin, enjoyable to knit with and creates flawless knitting in simple stocking stitch, lace and textures. This gorgeous yarn comes in a range of powdery pastel shades, all of which have a subtle sheen to them. Sirdar Snuggly DK 50g The UK’s favourite baby hand knit yarn, Snuggly Dk has a softness that babies love and comes in a wide range of colours, spot dyes and trendy colour twists. Snuggly Dk is easy care and will keep its quality through machine washing and tumble drying. Sirdar Snuggly Pearls Dk This high quality yarn has a very fine pearlescent thread running through these pretty baby colours – for special occasion baby knits. Snuggly Pearls Dk will keep its quality through machine washing and tumble drying. 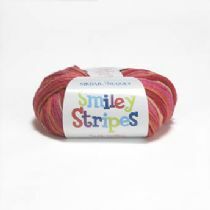 Sirdar Snuggly Smiley Stripes Dk is the most fabulously colourful yarn with an incredible multi-colour stripe effect in every ball. It is a gorgeously soft blend of 80% bamboo and 20% merino wool, a fabulous blend that’s just so soft to wear next to babies skin, and Smiley Stripes Dk is machine washable too. 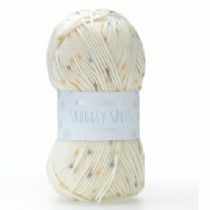 Sirdar Snuggly Baby Speckle DK is a cotton-rich blend made with 60% cotton and 40% acrylic and comes in a range of beautifully soft and speckled shades. It is a standard double knitting yarn and will knit to all Sirdar’s double knitting designs, not just for babies, toddlers and children, but for adults too. This gorgeous yarn is beautifully soft to knit and to wear next to your skin. It creates covetable, cottony hand knits in stylish colours and is easy care and machine washable too. Sirdar Snuggly Snowflake DK Snuggly Snowflake DK has been updated in a 25g format. It is more economical for you to use several of these delightfully sunny colours in one knit, as you can buy more accurate amounts of yarn with less left over. Sirdar Snuggly Tiny Tots DK This popular standard Dk yarn with a coloured nep adds real texture to baby hand knits. The colours range from pretty pinks to modern stones and browns. 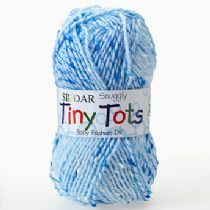 Snuggly Tiny Tots Dk will keep its quality through machine washing and tumble drying. This adorable spotty yarn comes in a range of six softly patterned shades that are perfect for both little boys and girls, shades include Baby Betsy, Chalky Chappie and Little Willow…how cute! King Cole yarns provide the excellent value for money with their great range of wool designed for babies. King Cole Cherish Baby DK is spun in Turkey from 100% Anti-Pilling Acrylic. Enticingly soft to the touch, Cherish Baby DK is spun in a 5 fold 2's construction giving a beautifully rounded thread to work with. 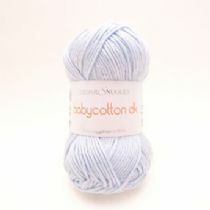 Cherish DK has been designed with babies and toddlers as its blend is light and the colours are baby pretty. Available in 11 self patterning print shades. Cherish will work to a standard DK pattern. 100% Anti Pilling Acrylic Weight - 100g ball. Length - 250m to a 100g ball (Approx) Needle Size: 4.00mm/US 6 Tension - 22sts & 28rows to a 10cm sq. .
Jolly DK is a scrumptiously textured yarn that is great for babies and children alike. It comes in a range of vibrant colour effect shades that kids are sure to love! It is a fantastic all season yarn and has plenty of stylish designs for children aged between 2 to 13 years. Jolly DK is machine washable on a wool cycle. Our Sublime baby blend of extra fine merino wool, silk and cashmere is renowned for being unbelievably soft and delicate next to your babies skin. 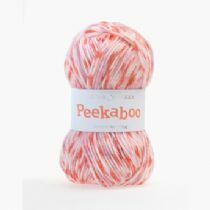 Sublime baby cashmere merino silk dk prints has this beautiful blend and comes in a range of softly printed baby shades.